Make All Your Social Images Rock! Social Studio FX saves me so much time and the results are very professional. If you manage many social media accounts as I do, you will appreciate the ability to update header images, post pic's, and every other type of graphic you need all at one sitting, with the same look and feel for consistent branding. Before Social Studio FX, i had to print out and refer to a chart that provided all the ever-changing dimensions for every type of graphic you could possibly need. 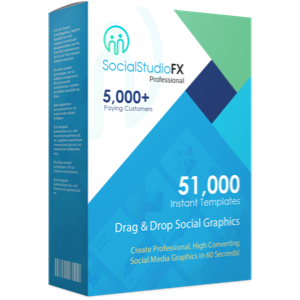 Social Studio FX is amazingly easy to use, its intuitive interface is laid out to support your efforts at creating great graphics. The amount of features available makes this the only tool I use for creating graphics. I love the transparency and rotation aspects to give the graphic more oomph and to stand out from all the other graphic noise on the internet these days. Having the ability to download makes it very versatile for me, as I often tie themes together on Facebook, Twitter and Google Plus. I enjoy using Social Studio FX as there are so many different niche templates available for eight social networks. You are simply spoiled for choice. Even better for me as I can use the web templates for my affiliate program. Making it really professional and eye catching. A great way to engage new prospects.